Abbas breaches peace talk conditions by making unilateral bid for international recognition; Kerry cancels upcoming visit to Ramallah. Palestinian Authority (PA) Chairman Mahmoud Abbas breached the conditions of the peace talks Tuesday by signing a request to join several United Nations (UN) agencies. Abbas obligated himself to refrain from such unilateral moves for international recognition during the course of the peace talks, restarted last July by US Secretary of State John Kerry. 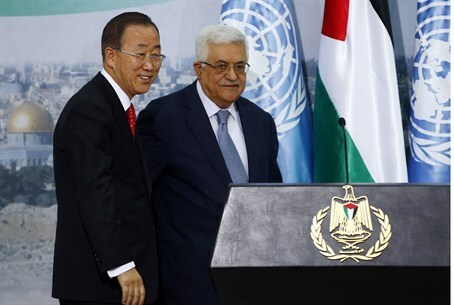 "The Palestinian leadership has unanimously approved a decision to seek membership of 15 UN agencies and international treaties, beginning with the Fourth Geneva Convention," Abbas said on TV following the signing, reports AFP. The PA chief also threatened that if Israel did not release the fourth batch of 26 convicted terrorists set to be released as part of ongoing talks, the PA would "immediately" seek membership in another 63 international agencies. "The demands (for membership) will be sent immediately," declared Abbas, but added "This is not a move against America, or any other party - it is our right, and we agreed to suspend it for nine months." Despite that insistence, in the last few minutes it has been reported that John Kerry cancelled his Wednesday visit to meet Abbas, in a clear sign of Washington's displeasure at the move and perhaps the clearest sign yet that the faltering talks are rapidly imploded. "We are no longer travelling tomorrow," a senior State Department said. Kerry had been set to meet with the PA leader in Ramallah, after a meeting with Prime Minister Binyamin Netanyahu on Monday took longer than planned, preventing Kerry's scheduled meeting with Abbas. The unilateral move by the PA effectively torpedoes the peace talks, which were set to continue until April 29, and which have been stalling of late amid Abbas's consistent refusal to recognize Israel as the Jewish state. Abbas set conditions on the extension of peace talks, demanding a Jewish construction freeze in Judea, Samaria and Jerusalem, as well as the release of the fourth and final batch of terrorists promised to the PA by Israel as a "gesture." Israel at least temporarily refused the last batch of releases this Saturday, given the wide-spread opposition to the highly unpopular move and the lack of progress in the talks. Just on Tuesday, reports revealed that the US offered to release Jonathan Pollard, now in his 29th year in an American jail for charges of spying for Israel, in a bid to save the talks. The offer for Pollard would have come in exchange for Israel's release of the fourth batch of terrorists, plus over 400 other Arab terrorists, including arch-terrorist Marwan Barghouti, and a temporary construction freeze in Judea, Samaria and Jerusalem. However, in a dramatic move Pollard waived a parole hearing on Tuesday to protest the release, given his opposition to such a deal that would set Arab terrorists free. Meanwhile a spokesman for Abbas's Fatah party revealed two weeks ago on official PA TV that the PA is using its non-member observer status in the United Nations (UN), given in 2012, as a "weapon" to "blackmail" Israel into releasing terrorists. Given the UN status, the PA has been "waving around" the threat of going to the International Criminal Court for around two years according to the spokesman: "we've obtained the release of the prisoners, we blackmailed [Israel], that is, in quotation marks, and we've taken important positions because we have a card that we're waving around."